Timeless White… Never out of fashion. White is a colour that never goes out of fashion. With more shades than you might think, there are a number of popular hues to choose from. All the big players including Farrow & Ball and Laura Ashley perennially stock some beautiful shades. This section covers some of our all-time favourites along with some advice to achieving the look you want for your newglass splashback. RAL is a colour matching system you might not be familiar with yourself, however your kitchen fitter or tradesman is likely to have a RAL deck in their box of tricks. 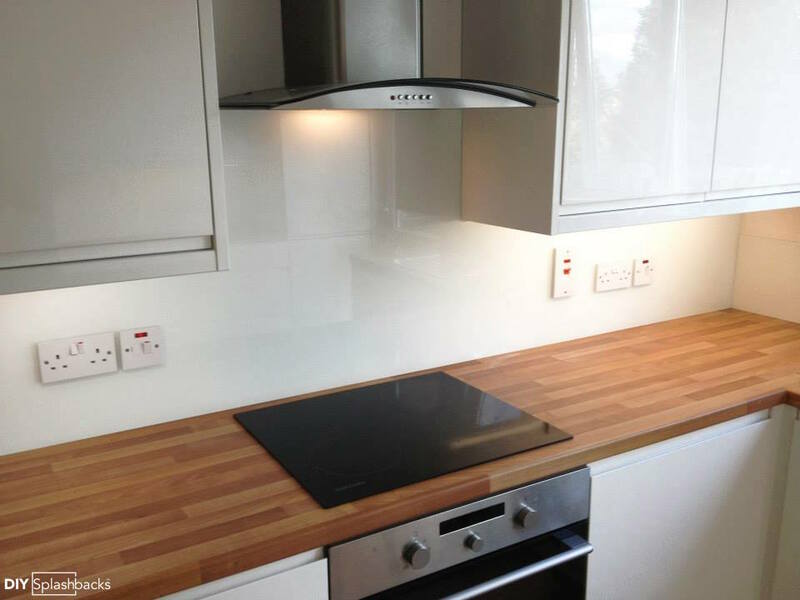 DIY Splashbacks offer glass splashbacks in the vast RAL range. The above splashback is RAL 9003 Signal White in a gloss finish. Slightly warmer than RAL 9010 Pure White, this client chose a shade that would compliment their Corian work surfaces. 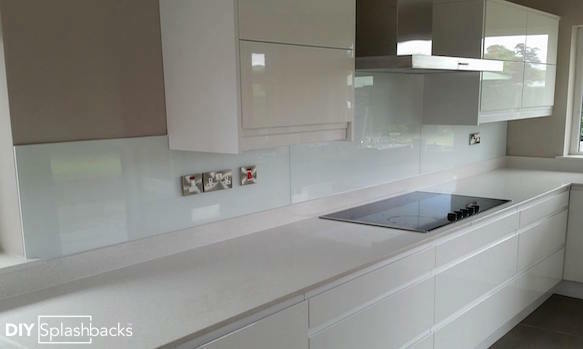 White is considered by some to be a safe colour choice when choosing a glass splashback. Neutral splashbacks have their advantages, there’s no doubt about it…. Undoubtably one of the biggest players in Paints this decade is Farrow & Ball. Their range of paints are fast becoming the authority on neutrals! The above glass splashback is Farrow & Ball Cornforth White. Their ‘whites’ range from pure white, to soft cream shades. An important thing to note when choosing a splashback colour is that colours can appear differently on screen compared to the shade you will receive in reality. The main reason for this is that each device has different display qualities. For example, the screen resolution on an iPhone will be different from that on an iPad, and iMac. In order to guarantee a match, we recommend ordering a glass sample on our website. Glass Samples are painted to order, are 10x10cm and are priced at £10 including delivery. We refund your first sample, should you place a splashback order with us. Order a Glass Splashback sample. An important thing to note when choosing a splashback colour is that colours can appear differently on screen compared to the shade you will receive in reality. The main reason for this is that each device has different display qualities. For example, the screen resolution on an iPhone will be different from that on an iPad, and iMac. In order to guarantee a match, we recommend ordering a glass sample on our website. Glass Samples are painted to order, are 10x10cm and are priced at £10 including delivery. We refund your first sample, should you place a splashback order with us. If you’re looking for the purest of whites on your glass splashback there are a few key colours in Paint Ranges. The above splashback is Dulux Absolute White. Unlike most glass splashback manufacturers we use the purest type of glass, known in the business as Opti. 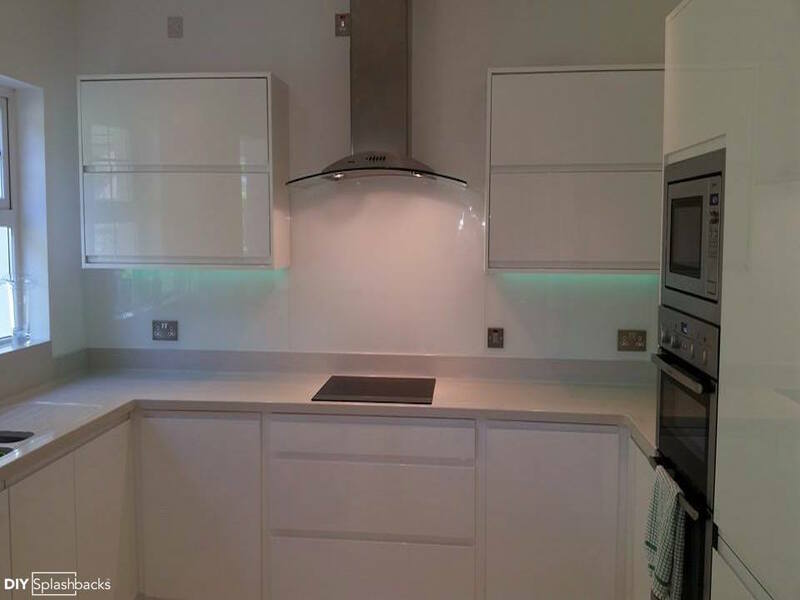 You may have noticed on other sites that some splashbacks adopt a slight green tint even if the splashback is meant to be white. This is because that manufacturer uses a type of glass known as float. Float glass has a higher iron content, which alters the appearance of pale colours. 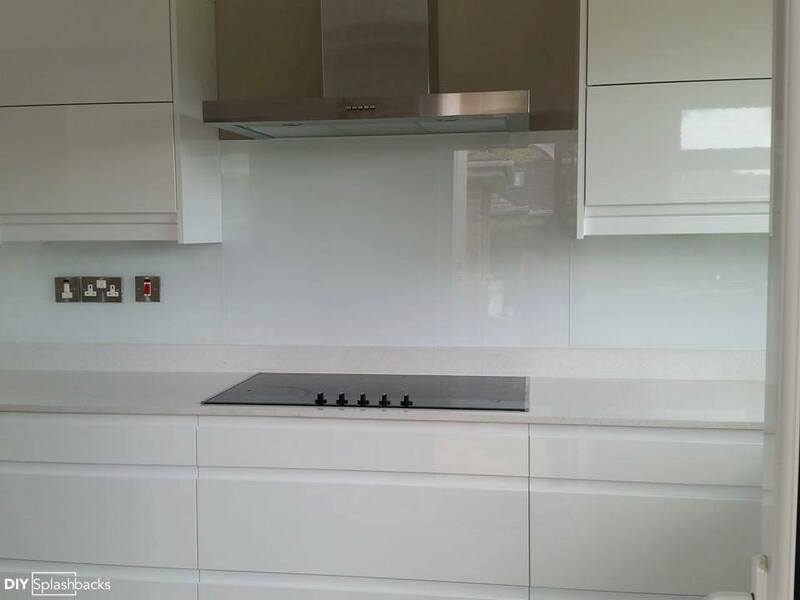 Our white splashbacks are as pure as possible in glass. Other key Pure Whites are RAL 9010, Farrow & Ball Wimborne White, Crown Pure White. We mentioned how white glass splashbacks are an ideal colour to remain neutral, but enable homeowners to add colour in accessories. 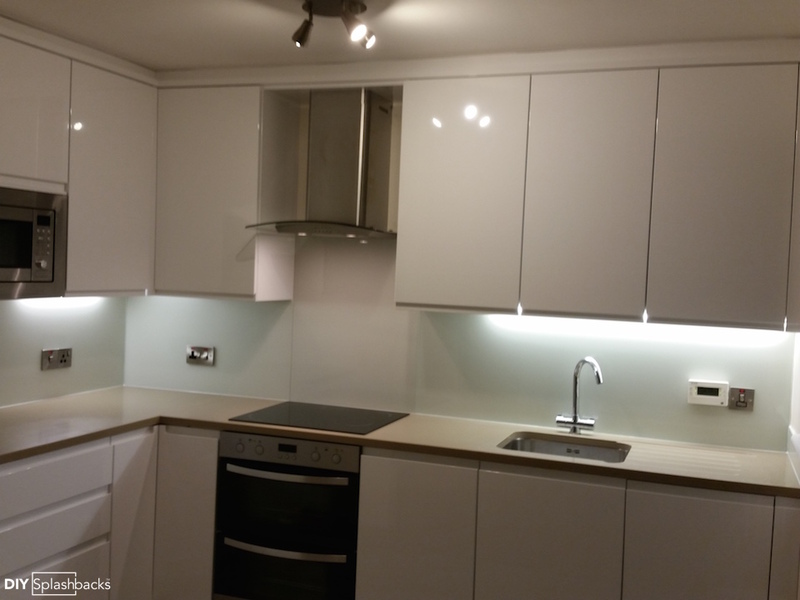 The splashback above is Dulux Absolute White, however the client added colour-changing mood lighting under their cabinets. This is a fun and relatively inexpensive way to add interest to an otherwise neutral scheme. It’s possible to create ambience and the flick of a switch! Definitely worth exploring if you are feeling adventurous! There is a wealth of inspiration online, from online magazines to interior design blogs. Pinterest.com We’re there, as well as thousands of other galleries of kitchen ideas. House & Garden A useful guide on white & neutrals. Houzz.co.uk A great article on finding the right shade of white. Farrow-ball.com How light affects colour.